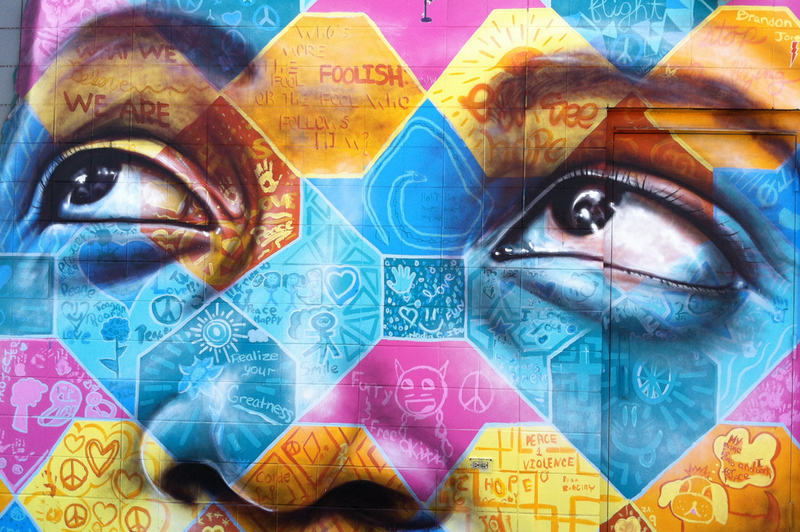 From refugee camps to favelas, from war torn towns to divided neighbourhoods, Joel Bergner’s mural work has brought light to arguably some of the darkest places on the planet. But his greatest works are never from a solely personal perspective. Bergner collaborates with grassroots organisations to communicate the local community’s hopes and dreams. Working as a counsellor in San Francisco, he treated youths struggling with issues such as violence, prostitution, suicide and drug addiction. His artwork was something he did separately, for fun. Although he works with people from all ages, children are often more willing to get involved with the creation of Bergner’s work. The Holywell Lane Wall at Village Underground was painted for Street Child United, a UK based NGO that promotes the rights of homeless youth around the world. Joel has worked with the organisation previously as part of the Street Child World Cup which brought together youth from across the world to play in Brazil during the FIFA competition. Whether it’s street art or football the idea is to allow young people to express themselves and then inspire others. This wall was created for the Street Child United summit and the giant girl is an ambassador called Jessica. Other Street Child Ambassadors were invited into the creative process and also asked to add their own illustrations within Jessica’s face. Bergner’s message is that his work isn’t done from a sense of guilt. His advice to help in a situation like this is to look to your own passions and strengths. There’s more information about Street Child Unite here and Joel’s website is here.